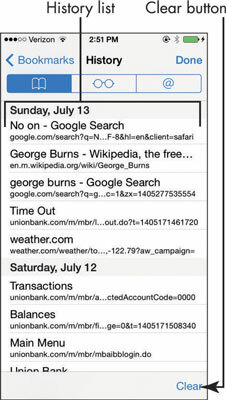 As you move around the web, your iPhone browser keeps a record of your browsing history. This record can be handy when you want to visit a site that you viewed previously but whose address you’ve now forgotten. With Safari open, tap the Bookmarks button. On the menu, tap the History item. In the History list that appears, tap a site to navigate to it. Tap Bookmarks and then Done to leave the History and then Bookmarks feature. 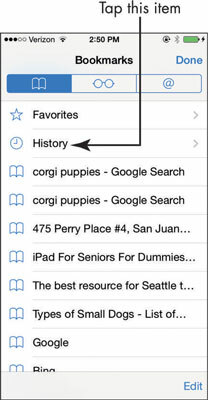 After you master the use of the Bookmarks button options, you might prefer a shortcut to view your History list. Tap and hold the Previous button at the bottom left on any screen, and your browsing history for the current session appears. You can also tap and hold the Next button to look at sites you backtracked from.